The Harlow Town Park Users Group (HTPUG) has for many years operated as consultative forum run by Harlow Council for local people to air their views to officers and councillors about the running and development of the Town Park. It is anticipated that full meetings of the group will take place every few months or when required. Meetings will probably be held on a weekday afternoon, but there may be evening meeting as well. For the time-being Harlow Council are making the Pets Corner Education Room available for group meetings. An earlier incarnation of the group was formed in the mid 1990's to support a funding bid which unfortunately was unsuccessful. After that the group lapsed for a number of years. In 2005 a constitution was written and bank account set up so that that the group could apply for funding for small projects from sources which the council itself was not eligible for. 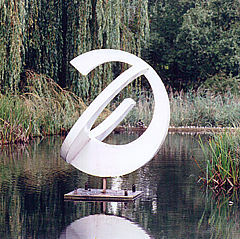 The restoration of the "pisces" sculpture in the park water gardens was a possible project. In the end the Council found some money itself. The frequency of meetings tailed off. The Council started consulting on a masterplan for the park in 2007 and a subsequent bid to the Heritage Lottery fund. This coincided with the contracting out of park maintenance operations to the Joint Venture company Kier Harlow. As a result the frequency of meetings rose, with meetings being held at mainly at the Harlow Museum, Muskham Road, Mark Hall North. To download — right-click and choose "Save Target As..." or similar. The above documents in PDF should be Acrobat 5.x (PDF v1.4) compatible or lower. You can access the download area of the Adobe® web site to download the latest version of the free Acrobat® Reader® software by clicking here . © Website design by Tomlins Web Designs. This page written by A.G.Tomlins.